Why is action needed on the EU decision-making process for taxation policy? In recent years, taxation has become a burning issue for the international community. Globalisation and the growth of the digital economy have forced leaders and policy-makers to grapple with an increasingly complicated landscape when it comes to taxation and revenue rights. At the same time, recent media tax scandals such as the Panama Papers have laid bare the shortcomings of an international taxation system that has allowed tax avoidance and tax evasion to take place on a scale previously unimaginable. Much progress has been made at EU level in recent years to advance the fight against tax avoidance and tax evasion and improve the Value Added Tax (VAT) system. Transparency rules have been strengthened to include much more information sharing between Member States on the cross-border tax affairs of citizens and large businesses. VAT collection has been improved with new rules for online sales of goods and services, as well as new cross-border cooperation tools to tackle VAT fraud. But the current EU institutional framework around these issues has been found lacking, as it requires unanimous agreement amongst 28 Member States before action can be taken. This unanimity often cannot be achieved or leads to sub-optimal policies. Proposals for fundamental reforms of the EU's corporate tax and VAT systems need to be adopted if the Union wants to ensure a Single Market that works for businesses and citizens alike: 74% of EU citizens expect urgent EU action on issues relating to tax justice. In his State of the Union address and letter of intent of September 2018, President Jean-Claude Juncker reiterated his personal support for a move towards a system of qualified majority voting in the field of taxation. What does the Commission propose to modernise decision-making on taxation? With its Communication published today, the Commission has opened the debate on how to reform decision-making in EU taxation policy. 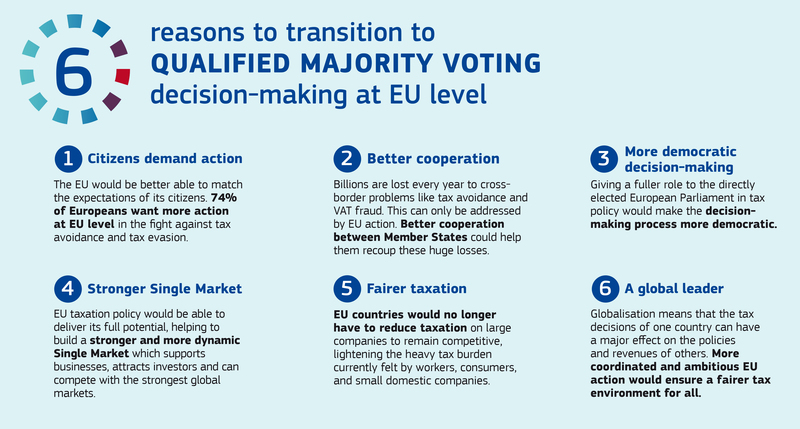 It makes the case for a gradual transition in four steps to qualified majority voting (QMV) under the ordinary legislative procedure in certain areas of shared EU taxation policy, with an active role for the European Parliament, as is already the case with most other EU policy areas. This move should help strengthen accountability in EU tax policy while improving the functioning of the EU's Single Market. Agreement to move forward on the approach suggested by the Commission in today's Communication would usher in a new dynamic and revitalise decision-making in this area. Addressing the difficulties inherent in the current framework would also help cement the EU's reputation as a global leader when it comes to finding modern and realistic solutions for taxation policy in the 21st century. What is the problem with the current decision-making process on taxation policy? It makes it very difficult to reach any compromise at all, because the opposition of just one Member State is sufficient to prevent agreement. Member States often hold back from seriously negotiating solutions in the Council, as they know that they can simply veto any result that they do not like. This explains why many taxation proposals require years for Member States to agree, or are simply blocked in the Council without any discussion taking place. Even when agreement in the tax field is reached with unanimity, it tends to be at the lowest common denominator level, limiting the positive impact for businesses and consumers, or making implementation more cumbersome. Some Member States can use important tax proposals as a bargaining chip against other demands they may have on completely separate files, or to put pressure on the Commission to make legislative proposals in other areas. This was the case, for example, when agreement on the Anti-Tax Avoidance Directive was held up by certain Member States seeking movement on another completely unrelated issue. Unanimity in the tax field is self-defeating. Decisions taken by unanimity can only be reversed or changed by unanimity. This often makes Member States overly cautious, dampening ambitions and weakening the final outcome. Lastly, giving it equal weight in deciding the final shape of EU tax policy initiatives would allow the European Parliament to make a full contribution to shaping EU tax policy and help create an environment for Member States to negotiate in earnest. What are the four steps proposed by the Commission? The Commission proposes a 4-step transition to QMV and co-decision, under the ordinary legislative procedure. In Step 1, Member States should agree to move to QMV for measures that improve cooperation and mutual assistance in fighting tax fraud, tax evasion, as well as for administrative initiatives for EU businesses, e.g. harmonised reporting obligations. These measures are usually welcomed by all Member States but are prone to being blocked for reasons unrelated to the issues at hand. The use of QMV under Step 3 would help to modernise already harmonised EU rules such as those for VAT and excise duty. Faster decision-making in these areas would allow Member States to keep up with the latest technological developments and market changes, benefitting EU countries and businesses alike. How would QMV in the area of taxation help to improve the efficiency of the Single Market? Taxation is central to building a strong and dynamic Single Market, given its influence on companies' decisions to expand, invest and employ across borders throughout the EU. QMV would help to defragment and strengthen the Single Market, accelerating progress on urgently needed tax initiatives and boosting EU competitiveness. A move to QMV could for example reinvigorate discussions on the Commission's proposals for a Common Consolidated Corporate Tax Base. This initiative, relaunched in 2016, would greatly reduce administrative burdens, compliance costs and tax obstacles for cross-border companies in the EU. Once fully operational, the CCCTB could raise total investment in the EU by up to 3.4% and would lead to an increase in growth by up to 1.2% (corresponding to about €180 billion). It could also revitalise negotiations on the Commission's 2017 proposal for a definitive VAT regime for the EU, which would help more businesses to reap the benefits of the Single Market, reducing cross-border compliance costs by an estimated €1 billion. The Standard VAT Return is another proposal that would have radically improved the business environment in the Single Market. Through a simple and harmonised system for filing VAT declarations, this proposal promised to reduce the administrative burden for cross-border companies by €15 billion per year but had to be withdrawn by the Commission following stalled negotiations and a lack of ambition in the Council. Similarly, under QMV the Commission's interim proposal for a solution for the taxation of the digital economy may well have already been agreed and begun delivering €5 billion in annual revenues for Member State coffers. What are the EU's competences when it comes to taxation policy? Taxation is a shared competence between Member States and the EU. Legislation can be adopted at EU level when it is necessary for, or directly affects, the establishment and functioning of the Internal Market and to avoid distortion of competition. More specifically, Member States can adopt at EU level measures and directives aimed at putting in place common national tax rules for indirect taxes such as VAT or direct taxes such as corporate tax. Such a reform would not give any new competence to the EU or reduce the competences of Member States, however. Nor would it affect the rights of Member States to set personal or corporate tax rates as they see fit. What should the role of the European Parliament be? In recent years, as major tax scandals made the headlines, the European Parliament has had a significant impact on EU tax policy, by using its political weight to push an ambitious agenda for fair taxation, through ad hoc committees. However, the European Parliament has no voting rights under the special legislative procedure in taxation. Political pressure is the only tool it has to influence EU tax decisions. A move to QMV, under the ordinary legislative procedure, would rectify this and allow the European Parliament to make a full contribution to shaping EU tax policy. Unbound by national pressures and interests, the European Parliament could provide fresh input into tax negotiations so that they better reflect the needs of the Union as a whole. This would create an environment for Member States to negotiate in earnest. Ultimately, a move to QMV under the ordinary legislative procedure could lead to more effective, relevant and ambitious outcomes for EU tax policy. Will these proposals remove the tax sovereignty of Member States? Over the years, sovereignty has been used to justify protecting specific national interests to the detriment of the Single Market. It allows Member States to build business models around the concept of a tax system, designed to attract certain activities or consumers. To protect a competitive advantage in specific areas, progress is sometimes blocked on tax files supporting wider EU interests. For example, the adoption of the Savings Tax Directive took more than 14 years. An amendment to make this directive more effective in tackling tax evasion was blocked for a further 6 years. It is fair to ask what is left of sovereignty when one Member State alone can block initiatives wanted by 27 others. Moving to QMV would not modify either the EU's or Member States' competence on taxation. It would only provide a way to exercise pooled sovereignty at EU level, granting Member States the strength to address shared challenges, protect their revenues, pursue growth-friendly tax policies and counteract external threats to their tax bases. Moving to QMV would in any case be a democratic decision entirely under the control of Member States. It was their unanimous decision to include the passerelle clause in the Lisbon Treaty. It would take another unanimous decision of the European Council to activate the passerelle. In addition, any national Parliament may object to this change and the European Parliament would have to validate it. What is the legal basis for moving to QMV? Currently, proposals in the tax area are governed by Articles 113 and 115 of the Treaties. Both articles provide for unanimous voting on taxation issues in the Council of the EU and the European Council. However, the Treaties also contain the necessary provisions to change decision making from unanimity to QMV in the Council through the so-called "clauses-passerelles". These articles allow for such a shift under certain circumstances. Article 48(7) of the Treaty on European Union (TEU) allows Member States to move from unanimity to QMV or from the special legislative procedure to the ordinary legislative procedure (with the European Parliament in the decision-making process) in areas usually subject to unanimity, including taxation. To activate this clause, the European Council must take a unanimous decision with the consent of the European Parliament and with no objection from national parliaments. The Commission now calls on the European Parliament, the Member States and all stakeholders to engage constructively in the debate on QMV in EU tax policy, and to define a timely and pragmatic approach for its implementation. In particular, EU leaders are invited to endorse today's roadmap and to make timely decisions on the use of the relevant legal provisions set out in the Treaties.